Wonder Woman 1984 just recently started production and instead of going the highly secretive route, Gal Gadot and director Patty Jenkins have been sharing pictures from the set. Earlier this week, both Jenkins and Gadot shared some pictures from the production, including one of Chris Pine, which officially confirmed the return of Steve Trevor, and a photo of Diana Prince staring at a wall of TV screens. Now, Gal Gadot has shared the very first picture of Diana in costume from the set of Wonder Woman 1984. 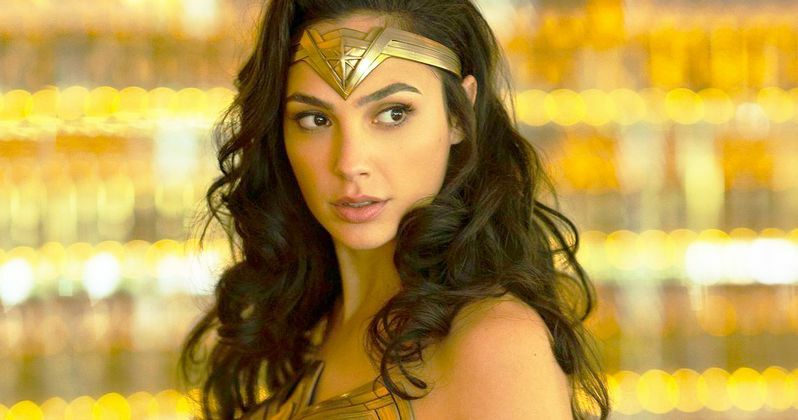 The new picture of Gal Gadot in the iconic costume doesn't shed any light on the plot of Wonder Woman 1984, but that's not the point. Not only does Gadot look stunning (as always), but she's here to let everybody know that she's back. The release of photos from the set is the complete opposite of what Marvel Studios does when production begins on one of their projects and it's refreshing. Instead of the production start date turning into technical jargon and speculation, Gal Gadot and Patty Jenkins are giving a spoiler-free look into the making of Wonder Woman 1984. The first Wonder Woman movie was the biggest success that the DCEU has seen thus far, shocking nearly everybody, including Gal Gadot and Patty Jenkins. The director famously only signed a single movie deal with Warner Bros. and DC Films, which meant that she was able to command a much larger salary this time around to reunite the crew from the first film. While Gadot's Diana Prince was a smash hit last summer, it wasn't enough to carry over and save Justice League. Wonder Woman 1984 is filming in Alexandria, Virginia and so far, we've seen Chris Pine rocking a fanny pack, Diana Prince in some business outfits, and some break dancers. All of the new views from the set show off the 1980s aesthetic in a major way, though the fanny pack was more of a late 80s and early 90s accessory. While we've seen quite a bit from the set, we still have not seen any pictures of Kristen Wiig, which will more than likely be kept under wraps, or at the very least, the pictures of her in full costume and makeup will be kept secret. Wonder Woman 1984 is set to hit theaters next year, so there's still a lot of work that needs to be done on the set as well as post-production, so it will be interesting to see what Gal Gadot and Patty Jenkins share in the coming months. Taking ownership of set photo leaks is a bold move and gives fans an official look at what's happening as opposed to a blurry photo or video taken from a mile away. You can see the very first picture of Diana Prince in costume from Wonder Woman 1984 below, provided by Gal Gadot's Twitter account.